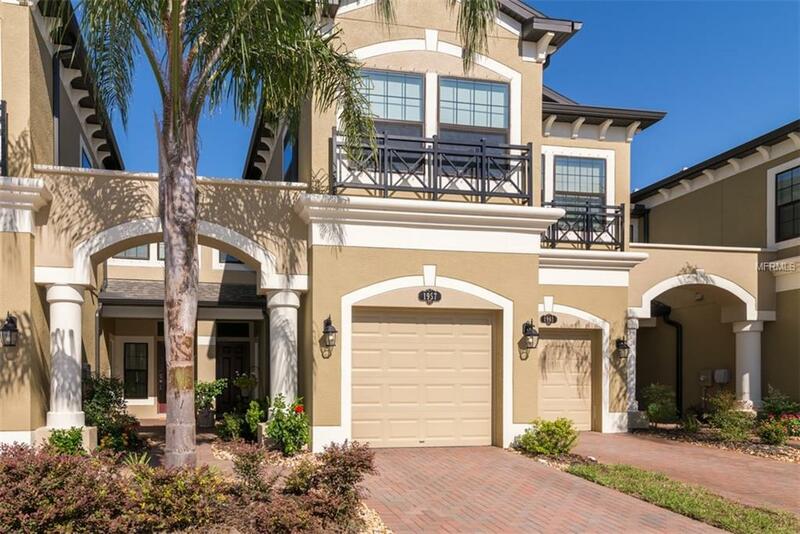 One or more photo(s) has been virtually staged Upgrades Galore in this spectacular 2 Bedroom plus loft/2.5 bath two-story townhome overlooking a beautiful pond with lighted fountain at night. Witness amazing sunsets from your screened in patio & master suite. The entire first floor features upgraded tile and the stairway up to and including second floor is Mannington Historic Oak Ash Plank Laminate. Upgraded quartz countertops in kitchen and listello tile backsplash complete this high-end designer white kitchen with stainless appliances. Master bath with gray cabinets, quartz counter and frameless shower. Master bedroom has two closets and decorative wall finish. Even garage has finished flooring and water softener/filtration system. These pond front units dont last last. Great investment can rent for approx $1600 month. Community has multiple pools, tennis courts, dog park, walking trails and access to Long Lake for fishing and non motored boats. Easy access to Veterans Expressway and 75. Full list of upgrades and Community Docs attached to mls listing. Additional Water Information Access To Community Lake-Long Lake. Pond Frontage/View.